During the month of June and into early July, the Mayer Lutheran Football Team had the opportunity to show off some of their potential skills for the upcoming 2018 football season. 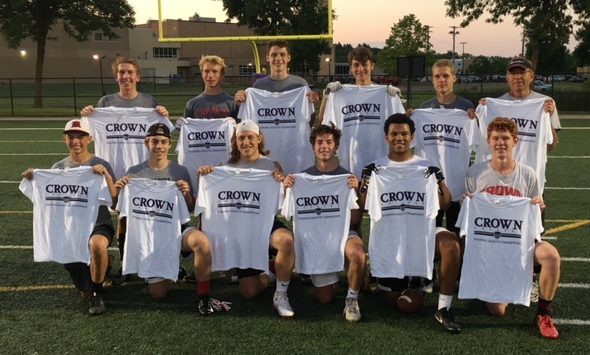 The Crusaders competed in the Crown College 7-on-7 Passing League held on Tuesday nights, playing 2 or 3 games each evening. The whole purpose of the league is to allow players to begin working together, improve their skills and just have fun. While the head varsity coaches are allowed to coach, the coaching strategies resemble the coaching you would see at a football practice rather than a game. It also allowed a great opportunity for Head Coach Dean Aurich to evaluate his players, share new plays and call signs, and allow players to familiarize themselves with the timing and running of passing routes. “You work on timing and route running” Coach Aurich shared. “It’s all about the reps. The more you get, the easier everything becomes.” The Crown Passing League does a great job by providing a great facility to play in, officials that know the game of football and friendly competition. The Crusaders won each of their games this season and ended up winning their division by defeating Eden Prairie in the championships and repeating as the 7-on-7 Crown Passing League Silver Division Champions. If the summer league is any indication to this upcoming football season, the future looks very bright for the Crusaders.